ERIE COUNTY, N.Y. -- This weekend's forecast is for weather with both high temperatures and high humidity. Erie County Executive, Mark C. Poloncarz and Commissioner of Health, Dr. Gale Burstein remind residents, especially those most at risk, to take necessary precautions as extremely high temperatures can adversely affect your health. "The most important point I can stress is that you should never leave a child, adult or animal alone inside a vehicle on a warm day, even with the windows cracked,"said Poloncarz. "That is a recipe for a potential disastrous outcome." "Anyone can become dehydrated. Those most vulnerable are the elderly, people who work or exercise outdoors, infants and children, the homeless or poor, and people with a chronic medical condition," said Burstein. "Excessive heat can lead to sunburn; heat cramps, heat exhaustion and heat stroke." Find places with air conditioning.Libraries, malls and community centers can provide a cool place to take a break from the heat. Drink plenty of fluids (preferably water) to stay hydrated.This does not include alcohol which will further dehydrate you. Avoid caffeine and sugary drinks. Do not wait until you are thirsty to drink water! Do not use electric fans when the temperature outside is more than 95 degrees.You could increase the risk of heat-related illness. Fans create air flow and a false sense of comfort but do not reduce body temperature. Check yourself, family members and neighborsfor signs of heat-related illness. 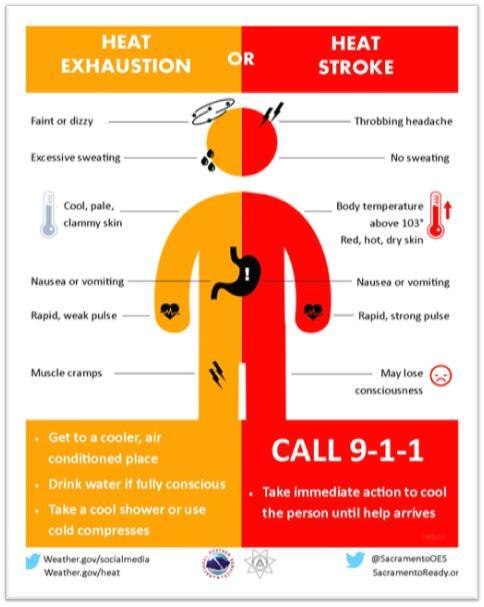 "Everyone should be aware of the signs of heat exhaustion and heat stroke," said Burstein. "Remember that the elderly, those with chronic medical conditions and the very young are especially susceptible to heat's effects. Most importantly, check on family, friends and neighbors who fall into the most-at-risk category twice a day to ensure their continued wellbeing."